I was recently asked if I would like to try a range of stocks for use at home. Now I'm never one to turn down such an offer but I did want to make it clear to the manufacturer that my opinion would be my opinion . . . good or bad! As the years have gone by, too many in my opinion, I have become more and more set in my ways. The young man who took risks and tried everything has turned into a rather conservative stick in the mud, reluctant to try new ideas or change the way I do things. So having used Knorr stock cubes for as long as I can remember, long before Marco Pierre White started extolling their virtues, I look upon alternatives with suspicion. I have not tried all five stocks yet but I have tried the veal, fish and chicken. The first to try had to be the veal as I have never seen this available to the home cook. I made up one heaped teaspoon with 500ml of boiling water. I tried it there and then and I have to say it makes a very nice warming drink but it made an even better dish. I have not worked out whether you are getting more stock for your money in powder form over the traditional cube . . . I just went and had a look and according to my reckoning the powder stock is better value. That of course assumes that the stocks are equal. Essential Cuisine's stocks are in my opinion superior to anything I have used before . . . which gives them added value. The fact that Essential Cuisine stock comes in powder form is an added bonus as it makes it very versatile for the home cook, in adding flavour to quick cook dishes or when you have misjudged and need to bring something to life with a slightly more intense flavour. This months product may not be available in your supermarket but it is available online. You can buy it from the web site of Essential Cuisine. Spanish roasted lamb is definitely one of those meals fit for special occasions or for enjoying with friends and family  especially during the winter months. 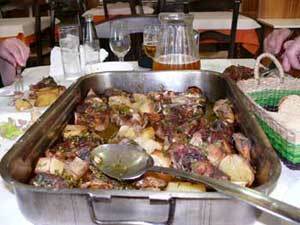 Lamb is prepared and cooked many different ways in Spain but by far the most popular in Andalucia is Asado de Cordero. The first time we tried this dish in a local restaurant it blew us away with the flavours and texture of the meat, cooked in real Spanish style the dish was actually prepared the previous day then was taken to the nearby panaderia or bakers who just so happened to have a clay oven designed for such things. The lamb was cooked for no less than three hours which, with a dish like this is the key to getting it just right. The lamb itself bred in certain pockets of the Granada province is also quite special, known as Cordero Segureno the breed has a distinct quality and is very hardy  perfectly suited to the harsh Andalucian countryside during the long hot summers. You can of course use any good lamb for this dish and it can also be cooked in the oven at home. 1 leg of lamb, machine cut into slices. Three or four medium potatoes. Grease the bottom of a large roasting dish with olive oil and lay the chops in the bottom. Peel and finely slice the onion and potatoes and slice the peppers. Lay the onion slices, then the peppers and potato slices over the lamb in the dish. 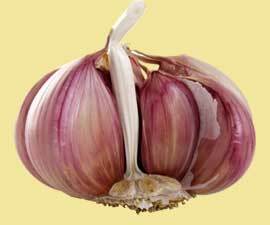 Peel and roughly chop the garlic then add to the dish, season well with salt and peppercorns. Add full sprigs of rosemary and thyme and a final drizzle of olive oil. Cook for 3 hours on a very low heat (140°C / Gas mark 1) adding a little water if necessary during cooking. A large roasting tray is ideal for this kind of Asado especially when feeding the family, the best way to serve is just like they do in Spanish restaurants and place the tray center of the table for everyone to get stuck in. Keep plenty of fresh crusty bread handy too for mopping up that herb and lamb infused olive oil. Asado de Cordero is a real family affair, a dish that brings people together around the table and great for any occasion. Buen proveche!! This recipe for Gypsy Tart by Tallyrand uses Muscovado sugar. 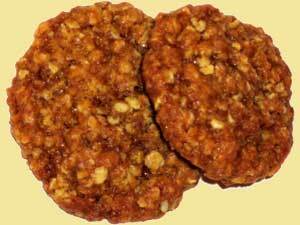 It is a British speciality brown sugar that is very dark brown and has a particularly strong molasses flavour. The crystals are slightly coarser and stickier in texture than other brown sugars. There are light or dark brown Muscovado sugars and the darker the colour is the more molasses and therefore the stronger the flavour. 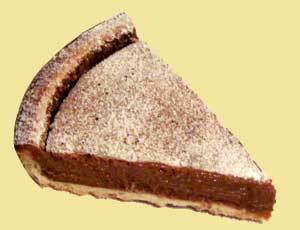 As Gypsy Tart is very sweet it is best served with some tart fruits to counter the sweetness (Kiwi fruit works well). Pre heat oven to 200°C / 400°F. Whisk evaporated milk and sugar together for 10 - 15 minutes until light and fluffy. Pour the mixture into the blind baked pastry case. The tart will have a slightly sticky surface initially but will set when it has been left to cool. Place the haddock, chopped onion, and bouquet garni into a saucepan. Cover with water and bring to a simmer. Skim the surface of any froth and simmer for 5 minutes. Lift the haddock from the pan and remove any skin and bones. Flake the haddock and return the skin and bones to the water. Simmer for 20 minutes. 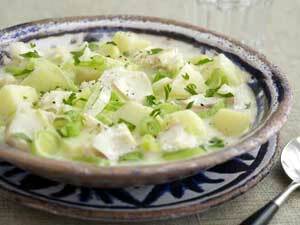 Melt the butter in a heavy saucepan, add the washed and sliced leeks, and cook until just soft. Then add the potatoes and cook for another 3 minutes. Add the fish stock and simmer gently until potatoes are tender. Add the haddock and check for seasoning. Put the sugar, flour and oats into a bowl and mix until combined. Melt the margarine with the milk and syrup. Take small pieces of mixture and roll to a golf ball size. Place on baking sheet and flatten slightly (they will flatten further when cooking). Bake in the preheated oven fro approximately 20 minutes (ovens vary) until golden brown. Remove from oven and remove biscuits to cool on a wire rack. If you are peeling only a few cloves, simply press each clove against the cutting board with the flat side of a heavy kitchen knife or press between the thumb and forefinger to loosen the skin first. If your recipe calls for a larger quantity of garlic, drop the cloves in boiling water for just a minute and drain quickly. They will peel quite easily. Alternatively you can use the microwave by cooking the cloves for 5 seconds or so to achieve the same effect. Test baking soda for freshness by pouring 1/2 teaspoon vinegar or lemon juice over the baking soda. If doesn't actively bubble, it's too old to be effective. Pour it down the drain and buy a new box! If you spill red wine on a carpet, pour white wine right over it. The white will neutralize the red wine. Follow with light soap and water and blot with a thick towel.